New WeVideo Business enables businesses of any size to quickly and cost-effectively create, collaborate and share engaging, professional-quality videos, anywhere. 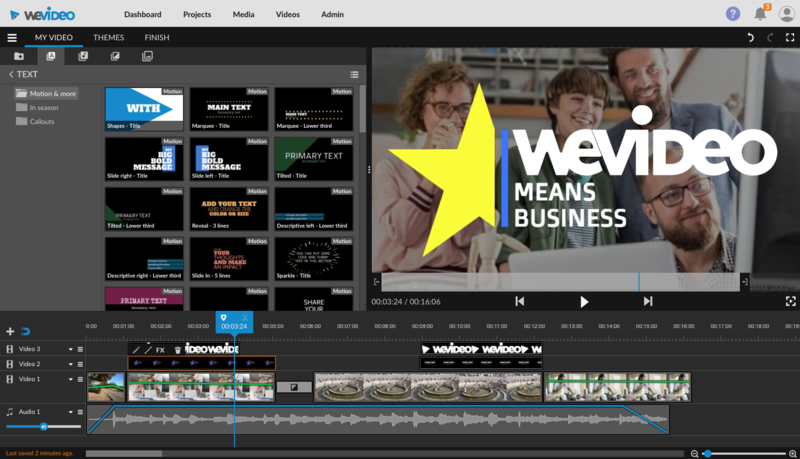 WeVideo, makers of the cloud-based video editing platform choice of more than 22 million account holders, today announced a new offering, WeVideo Business. WeVideo Business provides businesses of any size with the tools to quickly and easily create, collaborate and share engaging, professional-quality videos for marketing, social media, customer support, training and more. Through Cyber Monday, November 27th, WeVideo is offering a special early adopter discount that gives businesses 40% off the already low regular annual subscription price. WeVideo Business provides an expansive palette of creative tools including: video editing, motion titles and graphics, green screen, special effects, screencasting, speed control and more. Users can freely mix and match more than 600 audio, video, and graphics media formats with supported video resolutions up to a stunning 4K. Exclusive WeVideo JumpStart™ technology lets user start editing immediately without waiting for video to upload to the Cloud. Most important, WeVideo is easy-to-use and cost-effective, enabling anyone to create high-quality business videos from anywhere in just minutes.